October 1940. 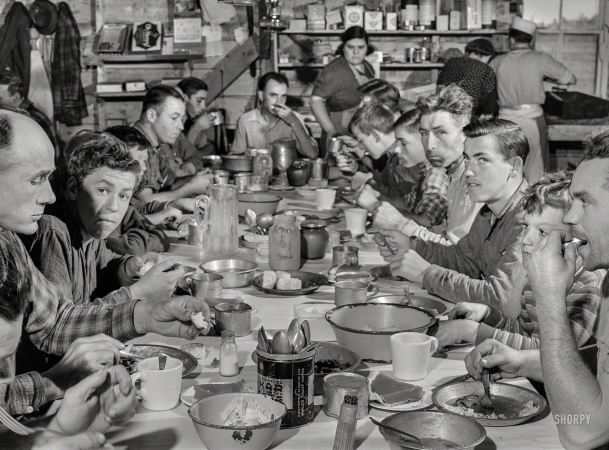 "Lunch hour at one of the farms of the Woodman Potato Co., north of Caribou, Maine." Click image above for larger view. To purchase, choose a size by checking one of the boxes below, then click "Add to Cart." 2019 marks Juniper Gallery's 13th year in the print-making business, from studios in Madison, Alabama, and Payson, Arizona. Reproducing images showcased on their website Shorpy.com (a TIME magazine Top 50 pick), owners Ken Booth and David Hall fill thousands of orders every year for individual customers as well as contract work for corporate, institutional and government clients. Our prints are made in-house using top-of-the-line, piano-size Epson SureColor printers with 11-color Ultrachrome inks and premium papers from Moab, Hahnemuhle, Arches, Ilford and Epson. Framed prints are offered in four sizes (USA only; details at right), matted behind clear acrylic in wood frames with a black satin finish. Free shipping in the United States for orders of $90 or more (international orders: See below). Shipping for orders of less than $90 ranges from $1 to $5 per order depending on paper size; see shopping cart for details. Large-format prints (13x19 or larger) are sent via U.S. Postal Service Priority Mail in 4-inch-diameter mailing tubes (5-inch diameter canisters for Special Edition prints). 8x10 Glossy Photo Prints are shipped in flat mailers via First Class Mail; 11x17 Prints are shipped in tubes via First Class Mail; Framed prints are shipped from Maumee, Ohio, via FedEx. For unframed prints, please allow approximately two weeks (10 business days) for printmaking and delivery from Payson, Arizona, or Huntsville, Alabama; three weeks for Special Edition prints; two to four weeks for framed prints. Prints in the smaller sizes may be returned for a refund if sent back (at purchaser's expense) within 10 days of delivery in the original mailer; Special Edition prints (prints 30x24 or larger) may be returned for replacement only, in the event of defect or damage. Framed prints are not returnable. INTERNATIONAL ORDERS. Shipping is $15 to $50 per order depending on country. See the Shopping Cart for which countries we ship to, and the exact amount after you've entered your order. WE DO NOT SHIP FRAMED PRINTS OUTSIDE OF THE UNITED STATES. Allow two to several weeks for delivery and customs processing, which will be expedited if you include a phone number with your order. All prints come with a blank border (plain white margin) for matting and mounting, as described at right. Captions, printed in the lower margin, state the subject, photographer and year for 19x13 and larger prints; framed prints, and prints on canvas, do not have captions. Please note that sizes on Special Edition prints are approximate to within an inch. SITE COPYRIGHT 2019 BY SHORPY INC.
Click any of the check-boxes below to choose a size . . . FRAMED PRINTS: Dimensions below are paper size -- the mat and frame add anywhere from 4 to 8 inches to the finished size. For example, the 1½-inch mat around the 8x10 "Floating Lady" print shown below adds 3 inches to the width and height; the frame adds another inch, resulting in a finished size of around 14x11.5 inches. The frame size of a 30x24 print can be as large as 38x32 inches, depending on the proportions of the photo. Framed prints are offered on your choice of 8.5x11, 11x17, 13x19, 17x22 or 24x30 archival paper (exact dimensions depend on the proportions of the photo; frames are three-quarters of an inch wide; the mat adds about an inch on each side for the smaller sizes, to up to four inches on the 24x30 gallery size). Frames are wood finished in satin black; photos are matted behind clear acrylic. Framing by Simply Framed of Maumee, Ohio. Allow two to four weeks for print-making, frame-making and FedEx delivery in the United States. Click below for examples of a framed 8x11 print. Dimensions of the frame are approx. 14x11.5 inches. All frames are approx. 1.5 inches deep. 19×13 inches on archival photo paper. Minimum one-inch margins: Image size for this photo on 19x13 paper is approximately 15 x 11 inches. Paper stock, chosen for best appearance, is Ilford Galerie Prestige Gold Fibre Silk (13 mil, 310 gsm, satin gloss finish, used for color photos and the darker monochrome images) and Epson Ultra-Smooth Fine Art (19 mil, 230 gsm, matte finish). 22×17 inches on archival photo paper. Minimum 1.5-inch margins: Image size for this photo on 22x17 paper is approximately 18.3 x 13.5 inches. Paper stock, chosen for best appearance, is Ilford Galerie Prestige Gold Fibre Silk (13 mil, 310 gsm, satin gloss finish, used for color photos and the darker monochrome images) and Epson Ultra-Smooth Fine Art (19 mil, 230 gsm, matte finish). Our most popular size: Compared to the same print on 19x13 inch paper, the 22x17 inch print is 62 percent bigger — about two-thirds larger. 30×24 INCH SPECIAL EDITION print on Moab Archival Photo Paper. Minimum 1.5-inch margins: Image size for this photo on 30x24 paper is approximately 26.5 x 19.6 inches. Moab Entrada Rag Natural Finish. Weight: 300 gsm; Thickness: 22.5 mil. Shipped in a heavy-duty 5-inch-diameter fiberboard canister. Please allow up to three weeks for printmaking and delivery. Compared to the same print on 22x17 inch paper, the 30x24 print is almost twice as large; almost three times the size of the 13x19. 58×44INCH SPECIAL EDITION XL-MAGNUM on PAPER or CANVAS. Image size for this photo is 54 x 40 inches. Printed with two-inch margins on the same 19-mil archival paper described above, or on traditional cotton gallery canvas -- the same as would be used for an oil painting. PLEASE NOTE: We supply only the printed canvas; you'll need to have your frame shop mount it on a stretcher. Please allow two to three weeks for printmaking and delivery. XL Magnum prints are special-order items and may be returned for exchange only. DIGITAL STOCK IMAGES are available in high-resolution, medium- and low-res versions, in both TIFF and jpeg formats, for print, broadcast (1080p, UHD 4k) and Web as well as other retail, commercial or personal uses. 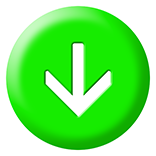 File size up to 200mb; resolution up to 10,000 pixels for +300-dpi printing. Click here or call 256-715-9612 for more information on royalty-free hi-res images or to buy this digital image.